Born on November 16, 1930 in Ogidi in Anambra State, Nigeria, Chinua Achebe was the quintessential African novelist. He was the gold standard for the expression of Africanness. He was a brazenly unapologetic advocate for African cultures, traditions and linguistics. Achebe mounted his defense of the African way of life from a microcosmic platform: by showcasing his own Igbo heritage. In his writings, he was not Nigerian. He was Igbo. Of course, he was older than the new country carved by Lord Luggard and his wife, like bread on their breakfast table. That was his own dilemma: he was a man born into the sacred autonomy celebrated by his Igbo people and the nation that was a fusion of other tribes with other ideas. This permeated his writing. Achebe questioned the interruption of African life by the West through church missionaries and merchants. His books were always exposing the open schism that had been wrought on Africa tribes by the introductions of totally alien ideas. It is important to note that Achebe’s magnum opus, Things Fall Apart, was an eerie prediction of the Biafra War, an event that left an indelible blot on the history of Nigeria. The war was like the schism in the tribe in Things Fall Apart. People with divergent views on authority and autonomy (in that nation) were fused together, resulting in conflagration. 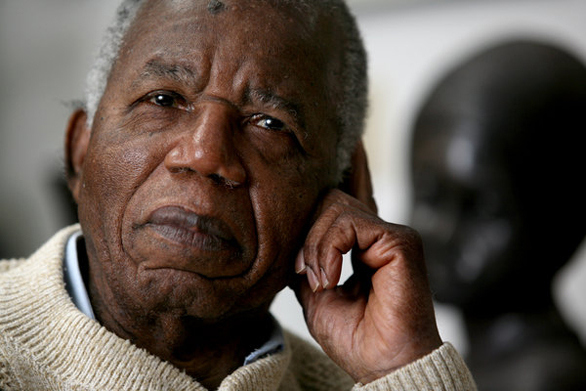 The war had a lasting impact on Achebe, lasting on his mind till he passed in March 2013. Even his last work was titled There Was a Country: A Personal History of Biafra. It is filled with those painful memories of a country in the birth pangs of the formation of its identity. Undoubtedly, Achebe was Africa’s father of literature. As editor, he paved the way for writers such as Ngugi wa Thiongo. There are few African poets and writers of note who do not ascribe inspiration to him. In the constant redefinition of Africa and Africans, his approach, as an individual and literary figure, is needed. He did not allow outsiders to control the narrative of his own people. He did not write to fit into an expectation or assumption of how and why African writers write. He wrote his story his own way. He wrote his poems for the ears and comprehension of his own people. His insistence of preserving who he was, regardless of pressures and influences, gives a valuable lessons to those who seek to walk in his footsteps. His death has left a vacuum but one that he will be happy to see that many African writers are working so hard to fill. Achebe is the one I am calling! Prince Mensah is a contributing editor and frequent contributor to One Ghana, One Voice. You can read more of his work here.